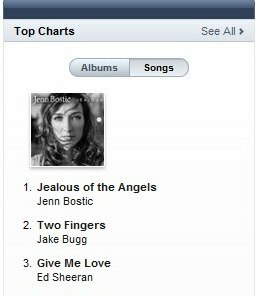 After Jenn's interview and performance on BBC Breakfast yesterday, "Jealous of the Angels" hit #1 on the iTunes Singer/Songwriter Charts in the UK, with the album sitting at #3! The physical CD is now available on Amazon in the UK & Ireland, hopefully coming soon to the US! For those of you in the UK, you can view the BBC Breakfast performance and interview by clicking here.